We recommend getting the Sporty's Instrument Rating Course and Sheppard Air Test Prep. Phase 1: Developing Instrument Skills— In this phase you learn preflight preparation for IFR flight, instrument scan techniques, basic instrument flight maneuvers, using the magnetic compass and post flight procedures following an IFR flight. Phase 2: Polishing Instrument Skills- Here you will polish your skills controlling the airplane by reference only to the flight instruments and learn to receive, copy and fly an IFR clearance. You will also learn to control the airplane simulating failure of the primary flight instruments and recover from an unusual flight attitude. Phase 3: GPS, NDB and VOR Navigation-This phase provides you the opportunity to develop skills and gain confidence using RNAV, GPS, NDB and VOR avionics systems for IFR navigation. In addition you will learn to apply these skills flying IFR departure procedures. Phase 4: Holding Patterns and DME Arcs-This phase introduces holding patterns including their purpose and the requirements for entering, flying and making reports if you have received a holding clearance. You will also learn to fly DME arcs. Phase 5: Precision and Nonprecision Instrument Approaches- During this phase you will fly both precision and nonprecision approach procedures while learning the visual references needed to make the decision to continue for landing. If the required references are not visible, you will follow the missed approach procedure. Phase 6: Automation, ATC and Other Approaches -In this phase, you’ll polish your skill with precision and nonprecision approaches. 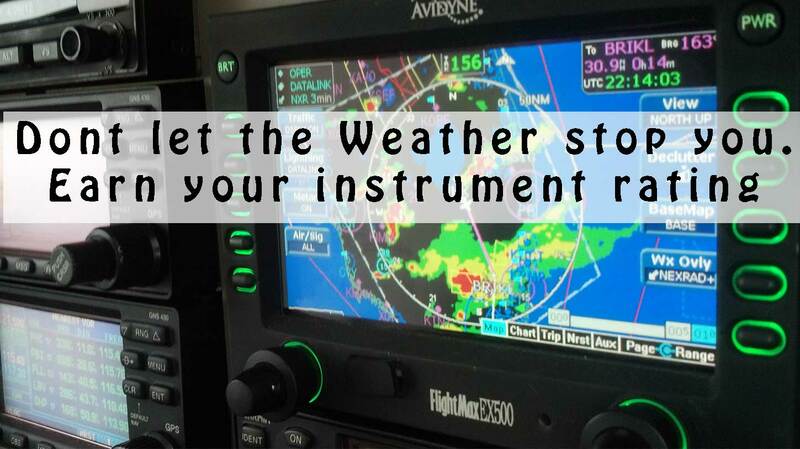 You will also discover the value of using the autopilot for instrument approaches. In addition you’ll learn about using a circling maneuver to align with the landing runway. Phase 7: IFR Cross Country- Here you learn the steps involved in planning for and flying safe cross countries under Instrument Flight Rules. During a long cross country you will use three different types of IFR approach procedures. Phase 8: Practical Test Preparation-In this phase you will polish all the instrument flying skills and knowledge you have learned to meet or exceed the Instrument Rating Practical Test Standards. How many hours does it take to get your instrument rating? Once I have my instrument rating, how often are proficiency checks required? For Part 61, as long as you stay active flying in instrument conditions and meet the Instrument Currency requirements, you just need a Flight Review every two years. For currency and proficiency read our post on this subject. Using a Basic Aviation Training Device (BATD) aka Flight Simulator, you can log up to 10 hours and using an Advance Aviation Training Device (AATD) you can log up to 20 hours. When using our BATD you can choose from different airplane and avionics. Our (future) AATD will focus only on G1000 Avionics, and different airplanes. When you decide to incorporate an ATD into your Instrument Rating Training you can expect the same level of training as mentioned above with the addition that you will start working on your IFR ATC communication, incorporating the use of your Electronic Flight Bag (EFB) and briefing approaches from the first few lessons. Making the transition to flying the airplane painless. Each of our FAA certified instructors and airline pilots is willing to share their knowledge of flying in ACTUAL instrument conditions and procedures, but most importantly, they want to share their passion of flying, making you a better pilot every lesson. Julian AND JD Aero were fantastic help in progressing toward my instrument rating. Having access to quality instruction and simulator time in Manhattan really makes it easy.